Introducing chip technology for Advantage Federal Credit Union. This gives you greater fraud protection when you use your card at a chip-activated terminal. Your new card will not only be more secure-it’s also easy to use. Here’s what you can look forward to as a cardholder. Whether you check out using chip technology or swipe your card, you can pay with confidence wherever Visa credit cards are accepted. If a chip-activated terminal is available, insert your card instead and follow the prompts. See detailed steps to the right.Easy to use. Keep in mind, you can continue to use your chip card online and over the phone the same way you do today. Advantage FCU Visa Credit Cards will feature built-in chip technology. You’ll enjoy global acceptance plus an enhanced level of security. When will I receive my Advantage FCU Visa Chip Credit Card? 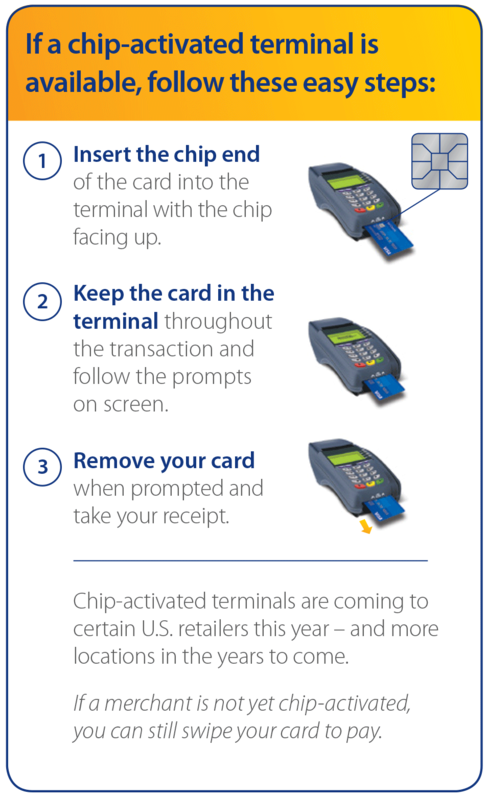 Advantage FCU is currently in process of transitioning to Chip Card technology. You should receive your new Advantage FCU Visa Chip Credit Card sometime in September. You will receive notifications to further inform you on the process. You can use your card at millions of places that accept Visa credit cards, at home and around the world. Yes. If a merchant is not yet chip-activated, you can continue to swipe your card. Keep in mind, you may need to sign for your purchase.